In Richmond Ballet’s “The Nutcracker,” Where Change is Constant, One Woman Keeps a Reassuring Approach | Theater | Style Weekly - Richmond, VA local news, arts, and events. Sarah Ferguson Susan Israel Massey, shown here middip, has played Grandmother in Richmond Ballet’s production of “The Nutcracker” for nearly three decades. Massey has worked with generations of Richmond children in the nationally acclaimed production. The Carpenter Theatre soon will be filled with tiny tots transfixed by twinkling tutus and bewildered by a famous battle scene. The familiar refrains of Peter Tchaikovsky's iconic score will herald visions of Sugarplums and flurries of sparkling snowflakes. And steadfast in her purpose will be actor Susan Israel Massey, whose sense of wonder and appreciation for the opportunity to perform Richmond Ballet's "The Nutcracker" remains a gift. Massey has been portraying the Grandmother role in Richmond Ballet's production for almost 30 years now, tenure that she couldn't even fathom when she attended her first party scene rehearsal in 1989. She had sights on the role a year earlier, volunteering backstage when her daughter was a mouse in the production. A few whispers about her acting background and interest in performing landed her an invitation to the party the following year. Massey had studied pantomime and character development at the University of Utah and, under director Willam Christensen's guidance, honed her innate affinity for nuanced character portrayals. She was itching to perform and saw the Grandmother role as an opportunity for artistic growth and longevity, two benefits of any great recurring role. Soon after, she was welcomed onto School of Richmond Ballet's full-time faculty, adding another layer of familiarity as she got to know student and company dancers alike. As she became woven into the fabric of the organization, the show itself went through theater changes, choreographic variations, production alterations, many generations of children and ranks of new company dancers. Through the familiar and the foreign, Massey has honored the grand "Nutcracker" tradition by approaching her role each year, and in every single performance, with a fresh and focused sense of discovery and imagination. "It's always the first party … and although the big picture is constant, the details and the characters are different every performance," she says, her enthusiasm still bubbling over. Massey has waltzed her way through the party scene with 10 different on-stage husbands, "each one a unique challenge," she says. She is quick to add, with a wry smile, that her "favorite performance and partner is always the present one." On stage, Massey is always in the moment. While she considers her performance preparation ritual "quite simple," her practices affirm her devotion to her craft. She arrives early enough to catch the end of the company dancers' warm-up "for inspiration," then spends 30 minutes putting on her makeup, wig and dress, becoming Grandmother. She visits the children's dressing rooms where her young students start their pursuit of lifelong ambitions, and is one of the first to arrive backstage before the show. "It is there that the excitement of work to be done becomes real," she says, although she admits that she is still "always nervous before going on stage." Perhaps gratitude is at the heart of what makes Massey's presence so memorable. She is generous, thoughtful and genuine in every interaction from the studio to the theater, and what she has created doesn't end when she steps offstage. "She is still one of the beautiful souls who not only enjoys performing, but also has dedicated herself to passing on the artistry and craft of the ballet," says artistic director Stoner Winslett. "Her professionalism and consummate storytelling has brought elegance, grace and real believability to our stage." 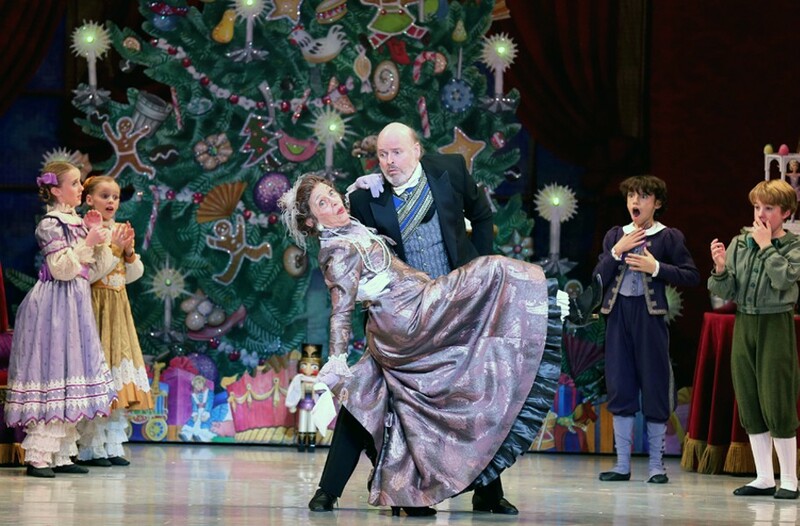 Although the Grandmother and Grandfather might seem like secondary roles, their arrival at the party scene signals the formal start to the gathering's gaiety, and the towering stacks of presents they bring for the children transform into the dancing divertissements in the second act. They propel the action and set the stage for the show to break the barriers between reality and fantasy. "It's probably the best role in the ballet!" Massey exclaims. Still a true believer in the magic, Massey has kept it alive, for herself, for the company, for the audiences, and for her own grandchildren, who affectionately call her Tutu. Richmond Ballet's "The Nutcracker" runs Dec. 9 through Dec. 23 at the Carpenter Theatre. Visit richmondballet.com for ticket information.